For sale at Whyte’s Auction, Royal Dublin Society, Ballsbridge, Dublin March 4, 2019, 6:00 pm. Estimate: 25 to 35,000 Euro. Update 4th March – The painting passed as it did not reach it’s reserve at auction this evening. Lord George Hell by Sir William Orpen (1901). Dimensions: 30 inches by 26 inches. Artist or Maker: Sir William Orpen K.B.E., R.A., R.I., R.H.A. (1878-1931). Exhibited: ‘The Art of a Nation: Three Centuries of Irish Painting’, Pyms Gallery London, June 2002, catalogue no. 30. 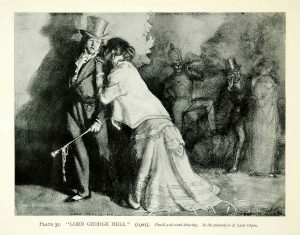 Notes: Lord George Hell is the principal character in Max Beerbohm’s The Happy Hypocrite, who falls in love with the dancer, Jenny Mere, an ingénue in the seedy world of corrupt impresarios. A Regency reprobate, he sets about to woo her, but in order to do so, must wear a mask to cover a pock-marked face. When he succeeds in his task and the mask is removed, his face has miraculously healed and become ‘saintly’ – such is the power of love. The story was published in 1896 followed by a one-act dramatised version at the Royalty Theatre in 1900. Orpen’s first version of the subject is likely to have been inspired by seeing this production, rather than reading the book. This was shown at the new English Art Club in 1901. It is clear in the present oil version that Orpen wished to recreate the impression of a late eighteenth or early nineteenth century print. The girls’ dress, bonnet and black shoes recall the maidens of Gainsborough, Romney and Hoppner and the encounter mimics, to some extent, that of Gainsborough’s Haymaker and the Sleeping Girl. In the present version Jenny is undoubtedly startled by Lord George and by the transforming effect of his love for her. The story of the miracle, revisited late in his career, clearly had a profound effect on Orpen since the original drawing was placed on his easel just before his death so that it could be transferred to oil. William Rothenstein, who recounted his visit to the Oriel studio after the painter’s death, was struck by the fact that, in the present work, Orpen had returned to such a profoundly personal early theme. He told Beerbohm, the author also was moved when he heard of the painter’s life-long fascination with his play, and reflecting on their friendship, replied, ‘I am deeply touched about the ‘Happy Hypocrite’ painting, and am glad that through my work I must have been in his thoughts’. Above text by Professor Kenneth McConkey from invaluable website. George Beresford by Sir William Orpen (1900). Possibly the male model for his Lord George Hell paintings. Orpen did a number of drawings of Lord George Hell in 1901 (including a Charcoal Sketch) and while working on a some old paintings just prior to his death in 1931 he resurrected the following version. It was on his easel at the time of his death so it remained unfinished. The female model is likely Orpen’s wife Grace (nee Knewstub) whom he married the same year. Max Beerbohm knew Grace and modeled the heroine (Jenny Mere) in the play on her and she was in possession of a pencil and wash version of it. Lord George Hell (unfinished) by Sir William Orpen. Lord George Hell (Watercolour) by William Orpen, this one was lent by Diana Olivier (nee Orpen) to the National Gallery Ireland for the Orpen Centenary Exhibition 1978. Plate 32. “Lord George Hell” (1901) Pencil and wash drawing. In the possession of Lady Orpen (Grace). 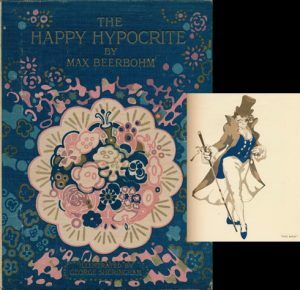 The Happy Hypocrite: A Fairy Tale for Tired Men written by Sir Max Beerbohm, first published in 1897. Sir Max Beerbohm (1872-1956) was an essayist, parodist, and caricaturist.